Hanley Castle High School students quizzed their MP on green issues as part of a national school reporters’ activity. 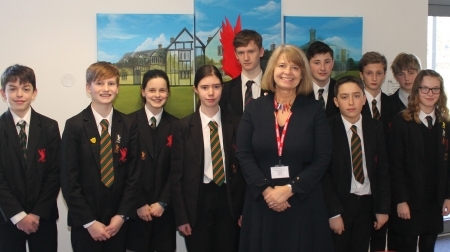 The budding newshounds quizzed West Worcestershire MP Harriett Baldwin on a variety of current affairs topics including school funding, the NHS and the Government’s environmental policy. The pupils were particularly keen to ask Harriett about policies on plastic recycling and reducing the impact of plastic in the oceans as part of a national BBC initiative to encourage schools to produce news from their local area. Harriett commented: “This is the second year that I have taken part in the BBC School Report project and it is always interesting to take part and talk to the next generation of voters. “This was a great chance to hear what young people really think and the issues that they care about most. Their three top priorities are the NHS, school funding and the environment and they hold some really passionate views on these important subjects. Photo: Harriett Baldwin MP with students from Hanley Castle High School as part of the BBC News Report initiative.